Ed Pawlowski, the Democratic mayor of Allentown, Pa., was charged on Tuesday as part of a federal corruption probe, according to his lawyer. Pawlowski is running for a fourth term and has consistently denied that he was misusing his office, which his lawyer Jack McMahon says he will contest. "There will be nothing but fight in Ed Pawlowski, because he did nothing wrong," McMahon said. He went on to say that the defense team will have more to say publicly after the indictment is unsealed, according to the Associated Press. The criminal case culminates an investigation that began in 2013 and led to charges against a slew of lower-ranking city officials and contractors in a pay-to-play scandal. Nine people have pleaded guilty. 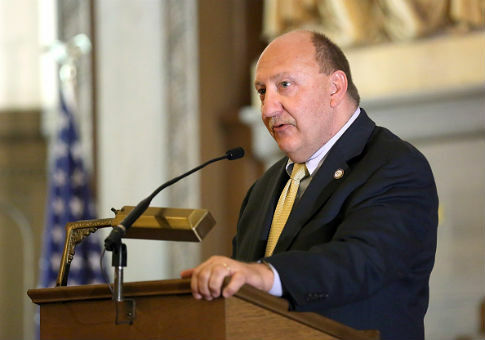 Court documents in the earlier cases allege that Pawlowski, identified as Public Official No. 3, ordered Allentown officials to give "preferential treatment" to political donors as the Democrat raised money for unsuccessful runs for governor and the U.S. Senate. Developer Ramzi Haddad, who earlier pleaded guilty to a federal bribery conspiracy charge, admitted that he raised tens of thousands of dollars for Pawlowski's Senate bid after the candidate "made clear" to city vendors, including Haddad, that giving campaign cash "was a necessary condition for receiving certain favorable treatment from the city of Allentown," according to court documents in that case. Allentown's top administrator, Fran Dougherty, admitted that he was involved in helping rig a $3 million contract to replace the city's streetlights. The money went to a company whose executives and consultants donated thousands of dollars to Pawlowski. Dougherty pleaded guilty and agreed to testify about "corruption in Allentown." However, Pawlowski would not go on the record about the indictment and instead texted that he will not "step down or drop out of the campaign." The FBI is running a parallel probe in nearby Reading, and it appeared charges might be imminent there, too. Federal prosecutors, the FBI and the IRS planned a Wednesday news conference to announce charges "in matters concerning Lehigh and Berks Counties." Allentown, which has about 120,000 residents, is in Lehigh County. Reading, with a population of about 88,000, is in Berks. This entry was posted in Politics and tagged Corruption, Pennsylvania. Bookmark the permalink.